An investigation into trace amounts of arsenic found in bottled juice has prompted advocacy group Consumers Union to urge the Food and Drug Administration to lower its standards for arsenic levels in juice drinks. The results of the study released Wednesday indicate that 10 percent of juices tested had total arsenic levels greater than the FDA's standard for drinking water of 10 parts per billion (ppb), while 25 percent of juices also had lead levels higher than the FDA's bottled water limit of 5 ppb. Consumer Reports tested 88 samples of popular brands of grape and apple juice sold in the United States, including Mott's, Minute Maid and Welch's. Most of the arsenic detected in Consumer Reports' tests was a type known as inorganic, which is a human carcinogen. The testing and analysis has led Consumers Union, the advocacy arm of Consumer Reports, to urge the federal government to establish a standard of 3 ppb for total arsenic and 5 ppb for lead in juice. "We're concerned about the potential risks of exposure to these toxins, especially for children who are particularly vulnerable because of their small body size and the amount of juice they regularly consume," said Urvashi Rangan, Ph.D., director of safety & sustainability at Consumer Reports. Although federal standards exist for arsenic and lead levels allowed in bottled and drinking water, there are no limits defined for fruit juices, a mainstay of many children's diets. In a statement to ABC News regarding the new Consumer Reports data the FDA -- which stated in September 2011 amid public controversy that apple juice consumption poses little or no risk -- said it is now gathering further information. "A small percentage of samples contain elevated levels of arsenic. In response, the FDA has expanded our surveillance activities and is collecting additional data," the agency said. The FDA's statement on the safety of drinking apple juice. Michael Landa, acting director of the FDA's Center for Food Safety and Applied Nutrition told two advocacy groups last week that the agency will collect and analyze juice samples from U.S. retailers to determine "the prevalence of arsenic in juice and to better understand the species of arsenic found in juice," according to Food Safety News. The Juice Products Association responded by saying that the study is incongruous. "Juice is not water. To compare the trace levels of arsenic or lead in juice to the regulatory guidelines for drinking water is not appropriate," the JPA said in a statement. Consumer Reports also analyzed the Centers for Disease Control and Prevention's data on arsenic in the urine of men and women who were willing to report their food and drink consumption for 24 hours prior. Analysis showed that people who reported drinking apple or grape juice had, on average, about 20 percent higher levels of total urinary arsenic than those subjects who did not. Patty Lovera, assistant director of Food & Water Watch, said it's important that the FDA establish an appropriate amount of arsenic acceptable in juice. "This is movement, and so that's encouraging, but we really want to see the agency get to a point where they figure out the right level," she said. Just over a week ago, the FDA announced the results of its own testing of apple juice -- most of which is produced in the U.S. The agency found that eight samples out of 160 had arsenic levels that exceeded their own "level of concern" for inorganic arsenic. Echoing Lovera and Consumer Reports' advice, ABC News' Senior Health and Medical Editor Dr. Richard Besser also says that the FDA needs to set a standard for apple juice for industry. The standard should probably be lower than what FDA is currently using, according to Besser. The divisive subject reached a fever pitch in September when Besser confronted Dr. Mehmet Oz on "Good Morning America" for what he called "extremely irresponsible" statements Oz made on "The Dr. Oz Show" in an episode focusing on the dangers of trace levels of arsenic present in many popular brands of apple juice. Oz's statements at the time were said to be misleading and needlessly frightening to consumers. Dr. Besser spoke on the subject on "Good Morning America" on Wednesday, explaining the faultiness of the information provided by the FDA and stating that he feels the agency should hold the juice industry accountable. "Back in September the FDA made a number of statements that reassured me. I'm much less reassured now. They published the test online, but withheld eight results that were very high," Besser said. Following their study, Consumer Reports says that since the harmful, inorganic type of arsenic has been detected in juice at high levels, it's best for consumers to reduce their exposure. 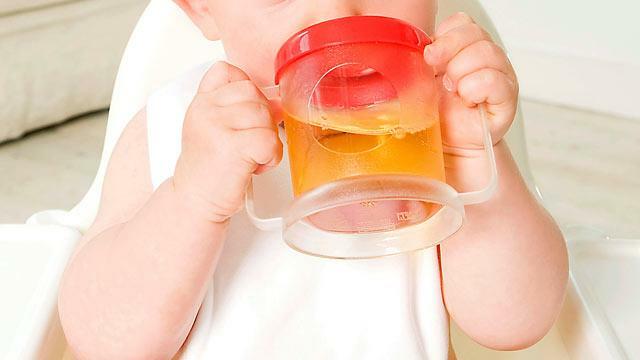 As Consumer Reports is particularly concerned about the amount of arsenic consumed by infants via apple juice, it has set guidelines for juice consumption for children. The group is now recommending avoiding giving infants under 6 months any type of juice, and that children up to age 6 should consume no more than four to six ounces per day. A Consumer Reports' poll also found that 26 percent of toddlers 2 and younger and 45 percent of children ages 3 to 5 drink seven or more ounces of juice a day; children up to six years old should consume no more than four to six ounces per day, according to the magazine, while older children should drink no more than eight to 12 ounces per day. Similarly, Besser says that parents should limit their children's juice consumption to no more than four to eight ounces per day. He also recommends that the FDA do additional testing of juices. ABC News' Linsey Davis contributed to this report.